Since their release in June 2015, the off-roading ability of hoverboards has improved. The thick rubber tires that most modern brands come with ride smoothly on rough terrain. Most models also have robust platforms and powerful motors that maximize the outdoor experience of riders. Which are the best off-road hoverboards in 2019? 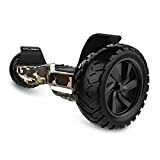 If you have saved enough money for a new off-road hoverboard, the 14 best brands in 2019 include: Skip to the best Off-Road Hoverboard on Amazon. What is the Best Off-Road Hoverboard? 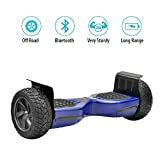 The best Off-Road hoverboard enables you to enjoy the ride even in the rough terrains just as you would when riding on smoother surfaces like concrete or asphalt. It will glide smoothly over the surfaces even when it goes through a large hole or bump in the ground. The good suspension absorbs maximum shock and vibrations which make you more comfortable despite the rough surfaces. In addition to improving the shock absorption, the large wheels maintain better contact with the road reducing any skids and slips that would make the ride less comfortable. They also are waterproof allowing you to still ride on under the rain or pass through puddles. GOTRAX Hoverfly is a popular all-terrain hoverboard certified safe for use off-road. Unlike some traditional ones that stuck in the sand or fell apart off-road, GOTRAX’s premium features give it an edge. Its rubber tires, for instance, are large (8.5-inches), durable, and optimized for riding off-road. Their intricate tread patterns, for example, have deep grooves that enhance its traction on loose ground. Both tires also have shock-absorbing designs that deliver a low-impact riding experience on most rugged terrains. Like CHO, GOTRAX Hoverfly is easy to ride in most environments. Off-Road Hoverboard is responsive self-balancing system maintains the stability of people automatically, which boost personal safety as well. Its battery, electrical system, and charger have safe UL-approved designs, while the dual 350W motors on its wheels reach 7.4MPH. While this is slightly slower than CHO’s 8.5MPH design, GOTRAX Hoverfly XL hoverboard works flawlessly to distances of around 12 miles. No speaker or Bluetooth connectivity. To own a safe hoverboard that works flawlessly off-road, CHO should be your go-to brand. Its eye-catching pitch black design can withstand the test of time. The heavy-duty polycarbonate plastic used to manufacture its shell, for instance, can support up to 120 kilograms. Therefore, most grown adult men or women can ride it at a top speed of up to 8.5MPH outdoors on rough terrain. The Off-Road Hoverboard 6.5-inch tires on this model, however, are slightly smaller than those of its predecessors. However, made from solid rubber, both tires deliver an enjoyable outdoor riding experience on most terrains. On this hoverboard, you can travel freely on gravel, grass, or mud without it slipping or sticking. For safety, CHO has a pair of high beam LED lights at the back, which boost the visibility of its riders at night. You can also connect a Bluetooth-enables phone on it and stream music wirelessly. CHO’s self-balancing technology makes it easy for amateurs or beginners to ride this electric hoverboard outdoors. 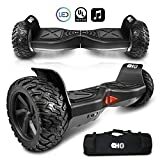 If you are scared of breaking a bone or bruising your elbows as you learn the ropes, look for one.CHO Off-Road Hoverboard is also one of the few dependable battery-powered hoverboards that are available online. The two 350 watt motors on its 8.5-inch wheels, for instance, have a combined power output of 700 watts. Full throttle, they propel this hoverboard at speeds of up to 8.5MPH with a load of up to 265 pounds. Its range is approximately 20 kilometers, while the UL-certified Li-ion battery it uses is safe for the environment and people. In just 90-120 minutes, you can charge it fully without the battery overheating or bursting into flames. If CHO’s stylish black theme does not appease you, its superior quality will. CHO Off-Road Hoverboards 8.5-inch tires are thick and therefore suitable for riding off-road. Made from solid rubber, for instance, they are not only durable but also shock-absorbing. Both tires also have heavy-duty motors (350 watts) that power them through tough obstacles that you might come across off-road. Like all of the best off-road hoverboards reviewed herein, CHO has a reliable self-balancing system. Most people weighing up to 264 pounds can ride on it for 20km at a top speed of 8.5MPH. CHO’s pedal height (110mm) is comfortable, while its UL-certified battery charges in just 90-120 minutes. For a few dollars, you get a cool hoverboard that delivers. Even CHO’s smaller wheels (6.5 inches) is a concern for some people; it is a beast outdoors. 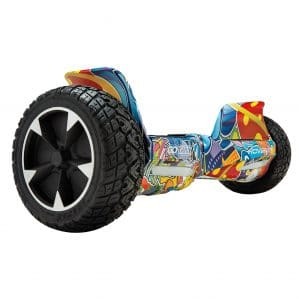 CHO Off-Road Hoverboard is rubber tires are not only durable but also roll smoothly on most terrains. They also have textured hand vacuumed designs that grip the loose and wet ground well. With CHO, safety will be the least of your concern. Its sturdy platform supports loads weighing up to 265 pounds. Its charging time is short (90-120 minutes), while its 36 Volt/4000 mAh battery has a range of around 20 kilometers. As such, it is perfect for commuting. If you want to ride on the rough terrains in a better way, then this all-terrain hoverboard will work fine. It’s fit for different terrains including sandy, rocky, gravel, and dirt. The item has a good clearance to prevent the bottom surface from scratches or being caught on sharp inclines or bumps. What’s more, it has 8.5-inch wheels, which get over depressions and bumps much easier than other smaller wheels. The unit comprises a tough board to handle the user’s weight and depends on a robust electric motor for power. It has firm grip rubber tires that provide good traction to minimize skidding. The UL 2272 certified hoverboard also features LED lights for better illumination in dark areas as well as builtin bluetooth speakers to keep you entertained. Moving around is more enjoyable and rewarding with the NHT self-balancing scooter. It’s useful in most terrains and can support a wide range of users. The board is also sturdily built to handle weights up to 264.5 lbs/ 120kg and comes with 8.5-inch rubber tires for easy movement and to also absorb the impact and shocks. Like other top types, this unit also comes with builtin bluetooth speakers for entertainment and Led lights for illuminating the path particularly in poorly lit areas. The anti-fire plastic construction can resist high temperature, heat, and fire without problems. If you want a self-balancing scooter that is easy to operate, this piece by HYPER GOGO should meet if not exceed your expectations. It’s among the most versatile and durable pieces in its class and this suits it for a wide array of users. The tough construction together with the fairly large 8.5-inch rubber tires allows for easy movement. Moreover, it comes with higher ground clearance, which minimizes the possibility of the electric scooter being stuck. The built-in electric motor provided good power for fast acceleration and torque for getting ever inclines. For entertainment, you get a builtin in bluetooth speaker, which delivers quality sound. Recommended for weights of up to 240 pounds, the Vecaro TREK-X-CMGR is among the “Big Boys” on our list. It can attain speeds of up to 10mph thanks to the powerful motors and the reliable Samsung 36V lithium-ion battery. The large tires together with superior shock system do a good job of minimizing the road vibrations and also keeping the board stable even on the roughest sections. A single charge gives you a range of 11 miles and since its UL 2272 certified, you don’t have to worry about smoke, fire, overheating or sparks. The only concern is the board’s heavyweight. 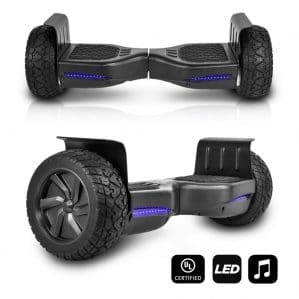 This UL2272 certified Offroad hoverboard is among the top sellers in the market. The self-balancing scooter is fit for different aged users and is fairly easy to learn how to tide. It g features large 8.5-inch solid wheels for a stable riding experience and a better ground clears to get over bumps and inclines faster and more smoothly. The tough board can handle heavy weights well whereas the decent size supports the user much better. It is powered via a 700-watt electric motor that pushes it over different terrains effortlessly. The powerful piece is also relatively silent and easy to maneuver. You also get bluetooth speakers to keep you entertained. The superiority of the Swagtron Swagboard Outlaw T6 has earned it the number one spot on our list. 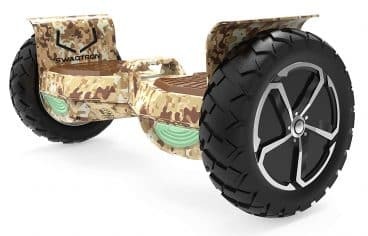 Swagtron Off-Road Hoverboard is Lithium-ion SentryShield battery is one of the best in this niche. After a two-three-hour charge, its powers this scooter efficiently for up to 12 miles. Off-Road Hoverboards top speed (12MPH) is desirable, while its 10-inch wheels that can scale up to 30-degree incline easily. Both tires are tubeless and infused with nylon for better stability and shock absorption. Swagtron Swagboard’s mold-cast aluminum and ABS plastic platform are durable. It supports heavy loads (over 200 pounds) while protecting this hoverboard’s sensitive parts as well. A new one will benefit you for years. Boasting of a newly-improved designed; this self-balancing board is 30% larger than the earlier version as well as most of its rivals. This means it has better support and is also more comfortable. It features dual motors each rated 400watts and both work together to climb inclines/steeps up to 18 degrees. The solid all-terrain tires should comfortably take you anywhere whether riding on grass, gravel, mud, sand or dirt. Riding in rain or through wet patches shouldn’t be a problem as it’s IP56-rated. Also, chances of sparks, fires, overheating or smoke is unlikely as its UL2272 Certified. What may concern you is the large and bulky nature that can pose carrying problems. Standard types usually come with wheels measuring 6.5 inches in diameter. However, those meant for off-road measure at least 8.5 inches. The higher the better since it will be able to pass through holes, cracks, uneven surfaces without sinking. Unlike the normal hoverboards that come with solid tires, off-road hoverboards feature pneumatic type. They are more bouncy, larger, and knobby and this makes them better for rough surfaces and improves road contact. Due to the rugged and uneven terrains, the hoverboards comes with softer shock system for absorbing the shock, impact, and vibration. At the same time, it’s much stronger to minimize chances of breaking due to high impact. An off-road board has higher ground clearance and this prevents the surface from touching the board’s lower section and damaging it. It also improves contact between the wheels and the ground. off-road skateboards are designed to handle a range of surfaces including smooth asphalt, rough concrete, grass, dirt, gravel, sand, mud, puddles and more. 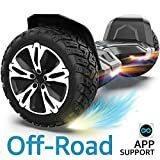 Just like off-road vehicles, this hoverboard also comes with all-terrain tires which are suited for any terrain or weather conditions. They will maintain good surface contact with dirt, concrete, gravel, sand, mud, asphalt and any other surface. Most also are waterproof to a certain extent and they will still work well in light rain. The hoverboard craze is still alive worldwide four years after their release. These off-road models are tough, powerful, and fun to ride on all terrains. 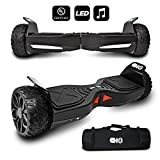 Buy with confidence that you will get the best off-road hoverboards in 2019. Do not be deceived by this hoverboards nature for it packs quite a punch. The 800-watt motor makes cruising the rough terrains feel like the streets. It comes in a decent size and should support even the heavy users. Thanks to the “Never-flat’ tires, you don’t have to worry about carrying the board, which can be quite tasking considering its weight. The wheels perform well on grass, gravel, dirt but have limitation due to the wheels small diameter of 8.5 inches. The board itself is quite solid and together with the powerful motor and rechargeable lithium batteries will tackle hill grades up to 20 degrees. We can’t deny that the EPIKGO Sport board is quite elegant and stylish. It also looks very well made to handle the tough outdoors. The two 400W motors perform quite well on grass, dirt, mud, sand and other places and will confidently scale inclines up to 18 degrees. This is credited to the All-Terrain racing wheels that measure 8.5 inches in diameter. Rated IP65, this board keeps going in light showers and also through paddles. And when fully charged, the battery should last for more than 10 miles or over 1 hour. 4. SWAGTRON T6 Off-Road Hoverboards – Best HoverboardsFirst in the World to Handle Over 250 LBS, Up to 12 MPH. You should consider making the Swagtron T6 your commuting partner. First, it comes with large 10-inch tubeless tires that will go on the rough concrete, uneven blocks, dirt, grass, mud, gravel, snow and also pass through water. Capable of carrying up to 420 pounds, you can be certain is very well built. And if doubting its performance, then the 12mph top speed should impress you. It comes with a solid suspension that absorbs road vibrations and shocks but will still maintain its rigidity in the event of high impacts. On a full charge, this accessory will operate nonstop for up to 12 miles. The power and torque of the Swagtron T6 allow the board to tackle inclines up to 30 degrees. Technology at its best is what best describes the Halo Rover hoverboard. The smart unit uses a series of sensors to provide the smoothest ride even in off-road settings. It also allows it to reach high speeds while consuming minimal energy. This ensures the built-in rechargeable battery lasts for longer the range is longer as well. The unit features 8.5-inch tires that never go flat and is UL 2272 certified in regard to safety (no sparks, no smoke, no fires, and no overheating). Other than street riding, this two-wheeled scooter handles mud, grass, gravel, snow, dirt, and bumpy surfaces pretty well courtesy of the large tires. If the best personal mobility is what you desire, the HoverboardX HBX-AT is what you need. Its two 400 watt motors are not only powerful but also very silent. They allow you to reach a top speed of 10mph but use less energy compared to its closest rivals. The solid board is made from strong, durable and rust-resistant aluminum alloy and features Led headlights for illuminating your path. Its large 8.5-inch All-Terrain wheels are not only designed for the outdoors but will last for a long time. They also maintain good contact with different surfaces including gravel, grass, mud, snow, gravel and more. The board can handle users weighing up to 264 pounds and can also be controlled viand app. Light rain and puddles aren’t a problem since it is IP65 certified. It’s also UL2272 Certified and won’t overheat, catch fire, smoke or emit sparks. This self-balancing hoverboard scores highly when it comes to stability, durability, effectiveness, and reliability. And just as the description states, it rides well in any terrain. The nice ground clearance together with the 8.5-inch rubber tires will get ever bumps; ride on both smooth and tough surface, and is ideal for dirt, sand, gravel or rocky surfaces. To put up with the stresses and high demands of the outdoors, the board is built from tough materials that are resistant to cracking, chipping, warping or braking. What’s more, it absorbs the shocks, vibration, and keeps the user steady at all times. The powerful 350-watt electric motors allow the unit to reach speeds as high as 7.4 mph within a short time. Since inception in 2015, hoverboards have continued to dominate the market. And in order to meet the growing demand for a better experience and more durable product, manufacturers are always unveiling newer and better products. One area that has witnessed considerable interest is the off-road riding. Initially, people used the two-wheeled scooters mainly on the pavement, sidewalks, and driveways, which all feature smooth concrete or asphalt. However, many now want to venture into the unbeaten paths and rugged terrains. To do this, they require better accessories that can tolerate the tough terrains, uneven surfaces, more exposure to the elements, increased shocks and vibrations and still have similar or better experience like riding on smoother surfaces. The best choice is off-road hoverboards. But which are the best? Before answering this question, it’s important to look at the important features. There goes the top 7 best off-road hoverboards reviews in 2019. These products outclassed the rest in the main areas which include tire size, wheel type, shock system, ground clearance, versatility, tire design and power. This enabled them to perform much better on the rough surfaces, offered better stability, had a longer range, and also came with a durable battery. The strong motors also allowed the hoverboard to go up steep inclines with lesser effort. For instant despite its ability to carry weight as heavy as 420 pounds, the Swagtron T6 can scale steeps as high as 30 degrees. They also offered remarkable performance even on demanding surfaces like grass, sand, snow, and gravel.